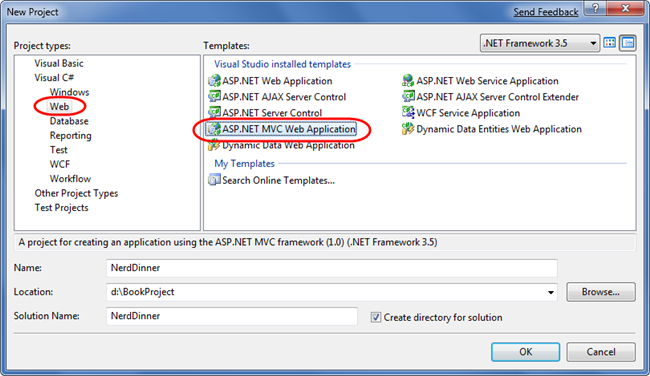 This is step 1 of a free "NerdDinner" application tutorial that walks-through how to build a small, but complete, web application using ASP.NET MVC 1. 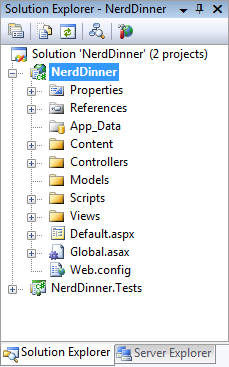 Step 1 shows you how to put the basic NerdDinner application structure in place. 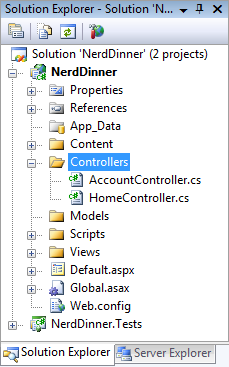 We'll begin our NerdDinner application by selecting the File->New Project menu item within either Visual Studio 2008 or the free Visual Web Developer 2008 Express. 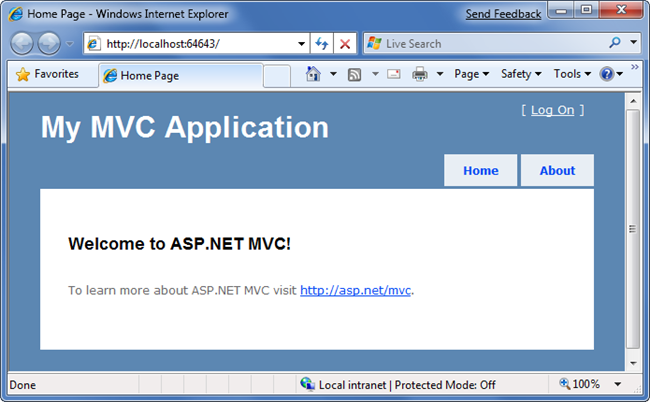 Important: Make sure you've downloaded and installed ASP.NET MVC - otherwise it won't show up in the New Project dialog. 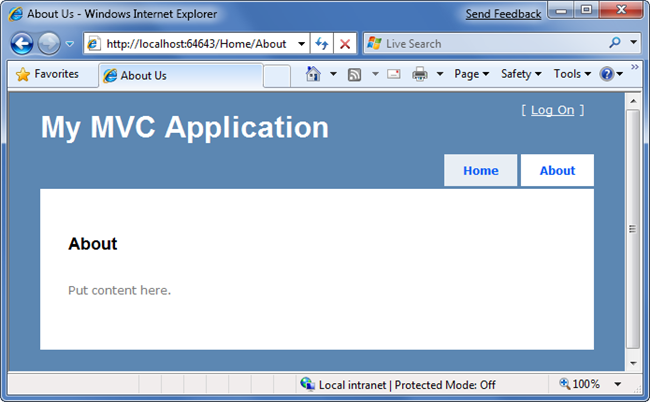 You can use V2 of the Microsoft Web Platform Installer if you haven't installed it yet (ASP.NET MVC is available within the "Web Platform->Frameworks and Runtimes" section). 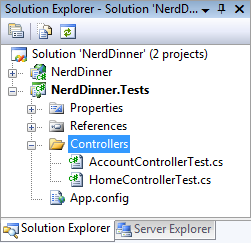 We'll name the new project we are going to create "NerdDinner" and then click the "ok" button to create it. 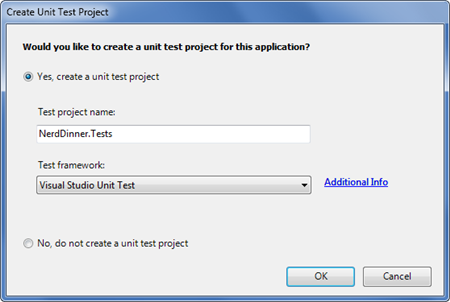 When we click "ok" Visual Studio will bring up an additional dialog that prompts us to optionally create a unit test project for the new application as well. This unit test project enables us to create automated tests that verify the functionality and behavior of our application (something we'll cover how to-do later in this tutorial). 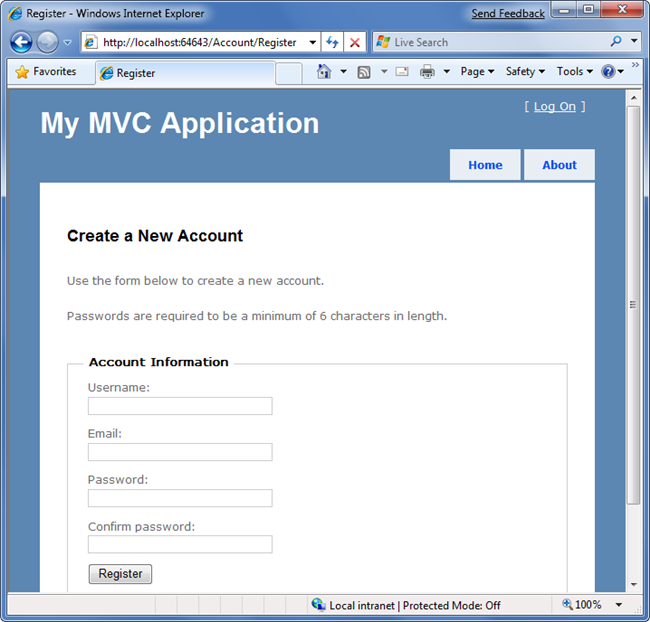 The "Test framework" dropdown in the above dialog is populated with all available ASP.NET MVC unit test project templates installed on the machine. Versions can be downloaded for NUnit, MBUnit, and XUnit. 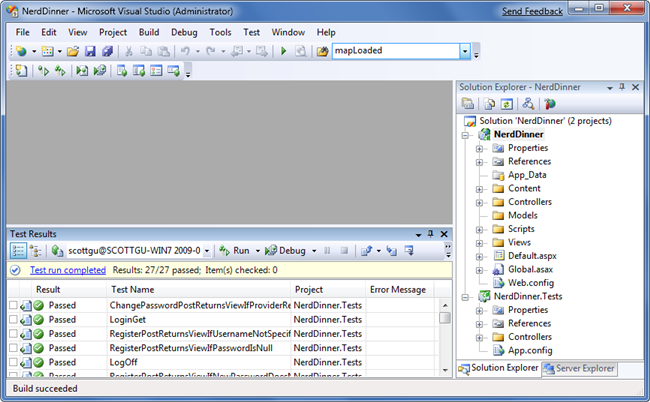 The built-in Visual Studio Unit Test framework is also supported. 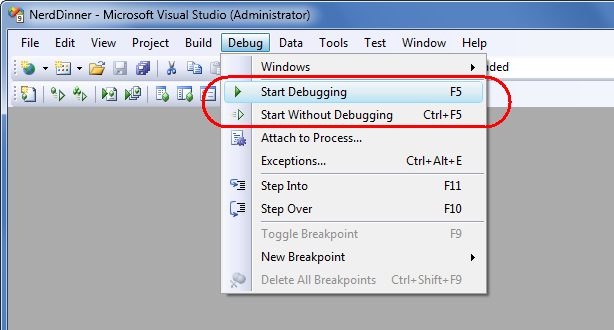 Note: The Visual Studio Unit Test Framework is only available with Visual Studio 2008 Professional and higher versions. 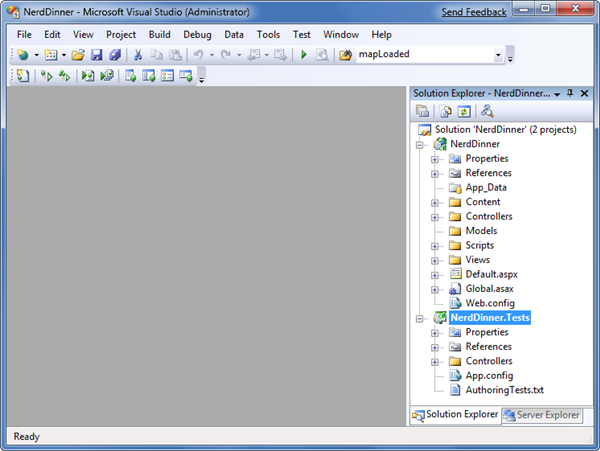 If you are using VS 2008 Standard Edition or Visual Web Developer 2008 Express you will need to download and install the NUnit, MBUnit or XUnit extensions for ASP.NET MVC in order for this dialog to be shown. The dialog will not display if there aren't any test frameworks installed. /App_Data Where you store data files you want to read/write. 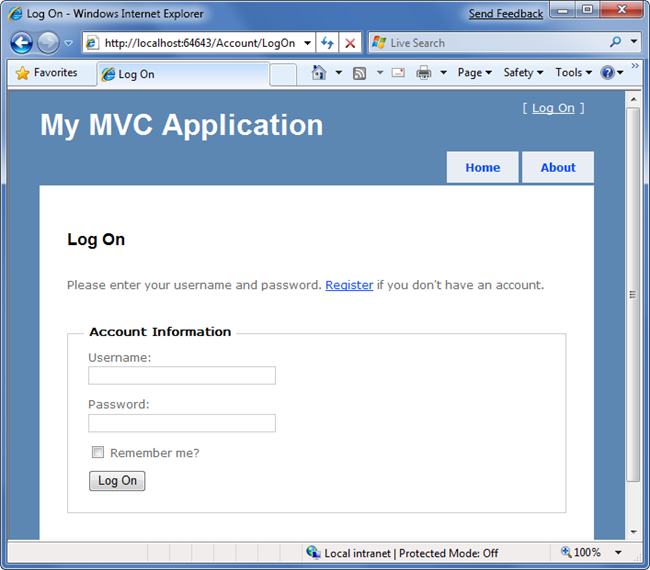 ASP.NET MVC does not require this structure. In fact, developers working on large applications will typically partition the application up across multiple projects to make it more manageable (for example: data model classes often go in a separate class library project from the web application). 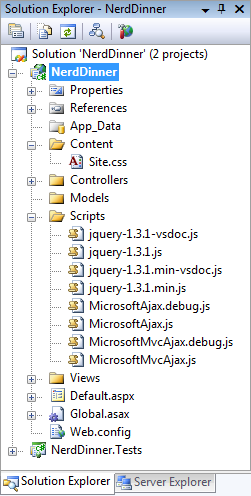 The default project structure, however, does provide a nice default directory convention that we can use to keep our application concerns clean. 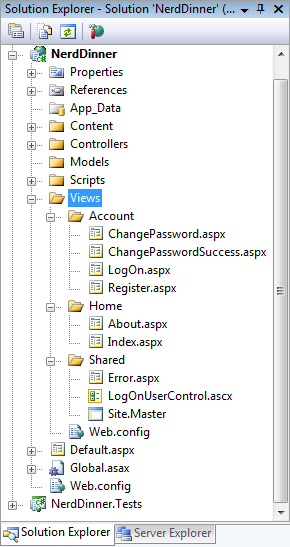 These default files added by Visual Studio provide us with a basic structure for a working application - complete with home page, about page, account login/logout/registration pages, and an unhandled error page (all wired-up and working out of the box). The code to implement the above home, about, and logout/ register functionality was added by default when we created our new project. We'll use it as the starting point of our application. Later in this tutorial we'll talk more about automated testing and add additional unit tests that cover the application functionality we implement. We've now got a basic application structure in place. Let's now create a database to store our application data.